After four days of glorious sunshine, at the stunning 1st Central County Ground Hove, Sussex CCC scored a wonderful Specsavers County Championship win over giants Middlesex CCC. Large crowds, including many away fans, were treated to a hugely entertaining and absorbing encounter where the result was in doubt until skipper Ben Brown scored 65 not out on the last day. Sussex started very much on the front foot when the popular Oliver Robinson seemed unplayable taking seven for 58 as the Lords team slumped to 230 all out. Then, Hastings born Harry Finch a promising young professional, went on to score a chanceless ton which was robustly cheered on Saturday afternoon. Back came the visitors as both Gubbins and skipper Malan gave a master class in batting under pressure. Their centuries had Sussex toiling under the hot sun through Sunday afternoon. However, patience is a virtue and just when it looked a little bleak spinner Danny Briggs suddenly took three wickets in five balls as the visitors mid/late order slumped again. The May bank holiday crowd then witnessed a brilliant run chase. After a slight wobble before lunch skipper Brown showed the way to take the win and 22 valuable Championship points. New head coach, Australian Jason Gillespie, is a winner, both as a player and a coach. He appears to bring a positive calm assurance and his Sussex players look to reaping the benefits. It seems that Jason allows players to express themselves without fear and play with a bit of swagger and enjoyment. Team spirit is at a very high level with positive banter very much on the menu. These things, in addition to the obvious talents around the camp, could make for a potent force in both red and white ball cricket. As Jason admitted after its just one win and there is huge amount of cricket to come. 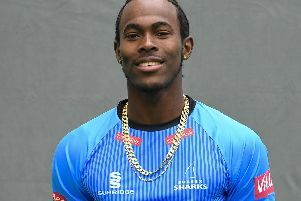 He would be the first to say that perhaps the only thing to concentrate on is the next Championship match verses Kent CCC at Canterbury on Friday. The team will again have to graft and do the simple things correct just to put themselves in the game. After that the new found confidence and swagger could sway the game in their favour. After some weather effected early games season 2018 is now fully up and running. There are hints of something very special to come. On Tuesday May 8 , I followed the 2nd team, under the guidance of Sussex CCC legend Michael Yardy, to the Ageas Bowl Southampton for a 50 over Trophy encounter against Hampshire. Skipper Tom Haines won the toss and decided to bat. He (40) and new boy Aneesh Kapil (27) started well taking the score to 50 off six overs. Delray Rawlins was going well but suffered a direct hit run out on 20. Laurie Evans seemed to be in great form but was unlucky to pick out a fielder on the ropes. Two more direct hit run out took their toll as Sussex finished on 158 all out. Hampshire openers Tom Alsop (91) and Ian Holland (55 no) took no time in finishing the job. There were positives for Sussex 2nd XI which they will need to build on next time out on Monday at Newport against Glamorgan. Season 2018 around the 1st Central County Ground is shaping up. Follow here!